Saying yes is the hardest part about living an abundant life. It means that I have to be willing to accept what comes our way — good or bad — as an enriching experience given to me so I can grow and flourish. Or I could take what is given and wilt from the exposure, but what kind of life would that be? Jim Carrey’s flick Yes Man comes to mind when I think of how our lives have changed and all the great places we have been to because we’ve said yes. We have been invited home more times than I can count, but I still remember the first time strangers took us in. That experience transformed our view of what travel could look like — we didn’t have to pilgrims in a weary world, we could be nomads flowing between friends! Still, I hesitate when I am offered assistance. I pause when we receive invitations. I don’t want to be a nuisance, I don’t want to take advantage of anyone, and I don’t want to be foolish. It’s hard for me to simply say yes. Today, when our newly-fixed bus broke down halfway up a hill in rural northern Tasmania, the one car that stopped to offer assistance was a young man who lives at the bottom of the hill. I thought my mechanical problem was temporary and only needed the bus to cool down — I said as much — but Josh said he’d come back and help after he off-loaded the mare that was standing quietly in the horse float behind his ute. Fifteen minutes later, when Josh turned up with his father Travers, they rapidly took over the bus. Talking among themselves, they diagnosed the problem and thought they could fix it, so we limped down the hill and up their driveway. Our girls have so quickly adjusted to our lifestyle that they don’t realise what a precious gift we are given by the people who invite us home. The girls aren’t afraid to say yes when offered yummy things to eat or drink, they’ll eagerly accept offerings of entertainment, and they’ll be forthright in asking for a bath in a new friend’s home. I’m the mature, boring adult lurking outside the house, not wanting to put anyone out, refusing cappuccinos and snacks, unable to really believe that what is offered is mine if I just accept it! The girls are fascinated by the stones in the garden and pick out the pretty ones, sort them by sizes, announce that they're electrical devices and offer them for sale. 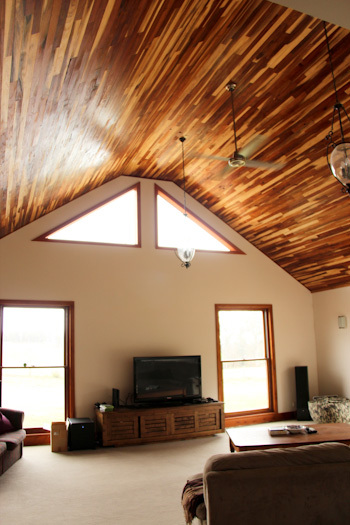 One end of the house has been completed with brushbox timber boards as a magnificent feature on the cathedral ceiling. Tonight I am so grateful for Josh’s offer of help and the way his family took us in. The fellows did fix the bus — an loose nut was the culprit of my mid-hill loss of power — and then they looked for more things to help with. 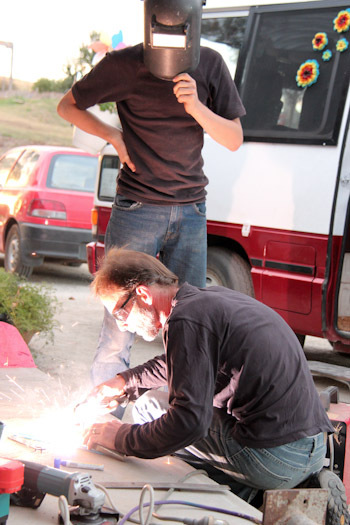 Micah and Travers weld up a bit of metal for our bed that we've needed fixed for a while. 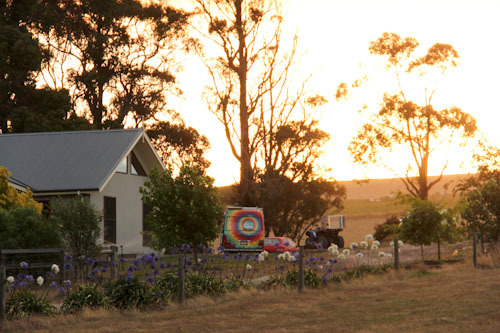 This is a lovely rural property, backing onto native bush. I’m still learning to humbly accept offers of assistance, which may be why we’ve had recent mechanical trouble. If I’m ever tempted to feel discontent in my circumstances, I just need to look at where we are — like tonight — and then I’m grateful once more, grateful that I accepted help. wow.i“d be the same, and I agree it happened for the very reason…. Yet amazingly, this community-centered lifestyle was the norm for many, many years before our modern, nuclear-family centric ways. I recently saw a great documentary called “Craigslist Joe” which, while centering around an American and Craigslist, really highlighted this idea that a community can exist wherever you make it. I think it’s only polite to show reluctance when offered something large. It shows that you recognise the magnitude of the gift/inconvenience. It’s one end of a gift sandwich, and thank yous at the other end are the other end. It may seem silly when looked at objectively, but then most things considered good manners do, even thought they’re essential to greasing the wheels of society. Look at it this way, when a friend offers to do the dishes after dinner at my house, 90% of the time I’ll say no, 10% of the time I’ll show them the gloves and sponge. But if they didn’t offer at all I would be very offended and think of them as rude and ungrateful, and probably arrange to meet at a restaurant the next time. Same goes with kids – you have to show that you’re willing to keep them under tight control at someone’s house even if it’s not required. Take asking for a bath, you’re expected to say (and I’m sure you do, I doubt you type out every word of every interaction for your blog!) “no, sweetie, this is not our house, we will have a bath in our tub tonight”, then 90% of the time the householder says “oh, no, that’s fine, do you want me to find some bubble bath for you?”. And some large proportion of those times they only say yes because you did that initial rebuttal which indicated you knew it was crossing boundaries and an imposition. You showing that made them feel positively towards you, and allowed it. So, yeah, longwinded way of saying reluctance is only a sign you were raised well! What a heartwarming story. I love to hear about the kindness of others. I think it’s great you could get help, we have had some hairy experiences travelling where people wouldn’t help. It is nice that you get help, but it’s even better to give it; especially seeing as a society we are willing to do that less and less. Being an object for others generosity is just as kind to them as they are to you because on the mundane level it makes people feel good about themselves and in other ways too. btw I saw you guys in my local paper! I was so shocked! 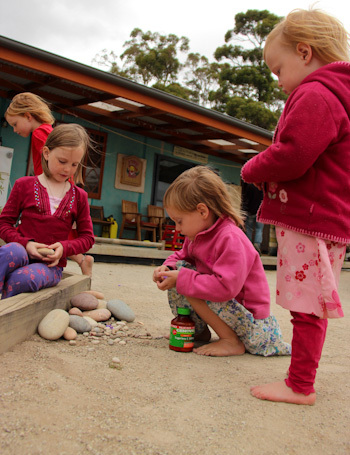 It was a great article on unschooling. I think that’s why Jesus tells us to have the faith of a child….they have no problem accepting the huge and incomparable gift He offers us! We feel embarrassed, think maybe it’s too good to be true, maybe there are ulterior motives, etc. (because experience has shown that to be the case more than once). But children seem to have an innate ability to know when people can be trusted and the gift can be accepted. I also wanted to tell you that a few days ago in a Bible study with African young men from all over French-speaking Africa, we were talking about Noah and the rainbow then being God’s promise to us. One of the guys said his name is Rainbow (but in his native language) and he never knew the significance of it. Another guy said “Rainbow” in his language means “mark of God” and was really excited to discover why it’s the mark of God. I just had to share that with you! I so know what you mean Lauren. We are always eager to offer our assistance/help to others but accepting is not always easy. For me I wrestle with I don’t want people to think I am needy or we can’t take care of ourselves. Sometimes I wish I had the guts (for lack of a better word) to just put out there what all my needs are (medication, food being the two primarily that are needed) but I don’t want the looks of pity from others. I know there is a fine line of asking for help and sounding greedy. I have asked for help for big things (like $$ for a new artificial eye) and yet the whole time I wonder what people are thinking of me (and my hubby) because we can’t provide for ourselves and needs. Thank you for reminding me to just say yes, thank you when offered something instead of hemming/hawwing around. May you have a blessed day!!! 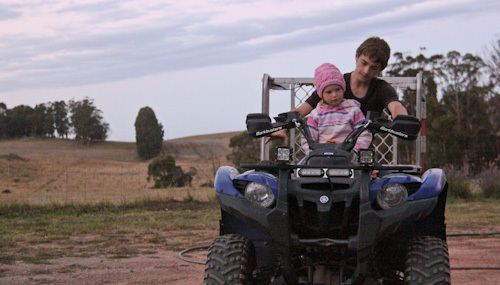 Please have your daughter wear a helmet if she rides a four wheeler/quad bike again. My brother died in 2002 when he was just 14 from head injuries sustained in a four wheeler accident and the doctors made it clear a helmet would have saved his life. Lauren, your lifestyle in its entirety is based on accepting help from others. To be waxing lyrical on the subject is a little odd. I know all about this ‘manners dance’ we often wouldn’t go out or would cut our visits short due to our son needing to be bathed at 6.30 SHARP and me not wanting to impose. Becouse of this when our friends came over I would always instigate a bath. So as to negate them having to have this internal ‘war’ of sorts – ok kids we have had so much fun today let’s go get into a big bath – toys bubbles etc included I would bat away the parents protest and find spare clothing if needed and towels and say honestly that its just a bath and spare clothes! While this. Is only an example and I understand the ‘dance’ and its place in our society I sometimes wish it wasn’t neccessary. I know how it feels to feel like an imposition and It always amazed me how David could walk up to people and just talk to them so when u guys. Started travelling it freaked me out – u are pushing bounderies and old ways of living even for those of us still ‘safe in the suburbs’!! So glad all your experiences so far have been positive and most often enriching ones! !